In case you are using the amazing mesh modifier add-on for Unity 3D, Megafiers, which among its many features adds morphing in the game engine, I've created a new script to aid the workflow between Lightwave and Unity - especially if you are using Mega-Fiers. 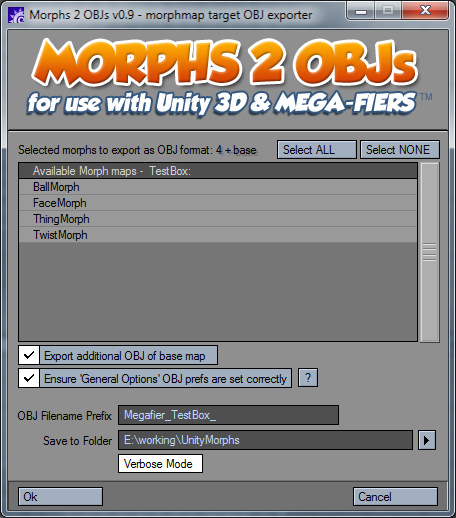 This Modeler script Morphs2OBJs exports morphmaps (Endomorphs) as separate OBJ files in one click. It's not rocket science by any means, however I find it useful since I haven't seen a script that does it. Btw Mega-Fiers allows you to use your standard FBX model/scene from LW as usual in Unity but allows you to use external OBJ files as the morph maps (since morphmap data is not obtainable in the LWO to FBX conversion or the FBX import into Unity). So instead of manually exporting each morphmap, this script does it for you. Plus it ensures your General Options settings will export them in a way that works. Once exported from the script, just load the gameobject into Unity and load the exported OBJs. Add the morphing component and voila - morphing works a charm! If you use Unity, I highly recommend Mega-Fiers from the Unity Asset store (I am not related to the company) as it works great with Lightwave - and this free script improves its workflow for LW users. However, this script is probably also useful for other reasons as well, possibly including working with Poser or Daz 3D. Or for anyone who wants to export morphs out as OBJs for other applications. There's a readme included for more info and some sample objects to test with. Feel free to critique or give feedback if it is useful etc. I've incorporated my MsgBox script in it to make it a bit more responsive and intelligent in various situations - though it may not be 1000% bulletproof. Tested on lw 9.6 and lw 10.1 and works great. What's wrong with this for Lscript v10.x? Only it DOES work in LW 9.6.1 Lscript. Is there a link to a v 10.x LScript release notes someone could point me to? Lscripters who use v10.x, is there any reason a simple string concatenation would work in 9.6.1 but fail in 10.1? Has matchdirs() changed for LW10? I can try and concatenating that in a separate variable and then passing it in if that may fix the 'illegal arithmetic' issue...? If there's a quick fix I'll recompile and reupload the fix. Sorry I can't be of more help without me having LW10 to test it in. bpritchard, are you still having issues with the script? Could you please try restarting Modeler and ONLY loading JUST the model with the morphs you want to export and then retry the script? It is possible this script is not bulletproof when multiple objects with multiple morphs are loaded at the same time.... I'll keep checking though. I'm starting to use Unity, and would like to use morphs on bones animated objects inside Unity... Do you know if it's possible, or has some limitations ? I haven't had a change to try it like you said.. i'll give it a whirl tonight. I use the third-party addon Mega-fiers for morphing within Unity. Unity gives you access to vertices in C#, but instead of "rolling-my-own" I bought Mega-fiers and it is awesome. Morphing with that on my boned FBX rigs exported from LW works fine in Unity. With boned objects I've used the morphing primarily for facial expressions and mouth shapes and it seems to work fine. Thanks very much for making this available. Do you know what would be involved with importing morph mixer animation data into Mega-Fiers to accompany this script, in the same way that Chris has done for Max? In Unity, I don't tend to use the editor Animations as I usually do all my animations in code or have them embedded in the FBX. I view the Unity editor Animations much like the timeline in Flash - useful for banner ads or people who don't code, but most of the time I find it more robust and flexible to code the animations or just access them from within the content (the FBX) as opposed to having yet another timeline (on top of the LW channel envelopes and the dynamic tweening using iTween in the C# code in Unity). Without rewriting a new FBX importer for Unity (which would be a big job) and assuming that the existing Unity FBX importer does not import MorphMixer data or at least have access to it (Chris knows much more about the specifics of the Unity FBX importer than I do), then we would need a way to transfer that morph mixer animation from LW to Unity with some intermediate file or LWS reader in Unity. I just meant parsing the text file that Motion Mixer exports (with keyframe/channel data), and recreate the keys in the existing channels in Unity. I was going to ask my coder to look at it, and I thought since you'd been looking at Mega-Fiers that you might have some tips.